What's cuter than a bear? A bear in pajamas of course! And the Christmas gift sharing begins! 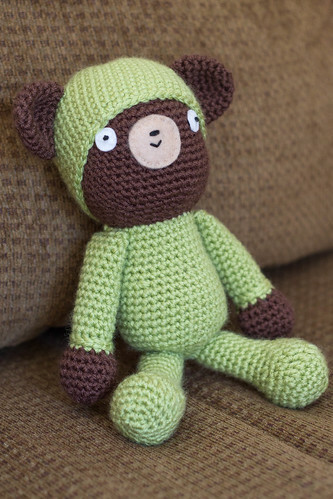 I made this bear for my cousin's baby from a pattern in Ana Paula Rimoli's book Amigurumi Two! This book was the first amigurumi book I ever bought. I think the patterns in it are adorable and easy too! I recently saw a picture of baby Gavin snuggling with his bear, so I think it's safe to say that he liked it! Have you guys crocheted anything from Ana Paula Rimoli? This is so cute Kate! I've tried Amigurumi, but I get so confused…even when I've tried using stitch markers…it's the beginning part that gets me. Maybe I need to try again in 2014! This is a bear with character! I love the pale green against the dark chocolate brown bear!